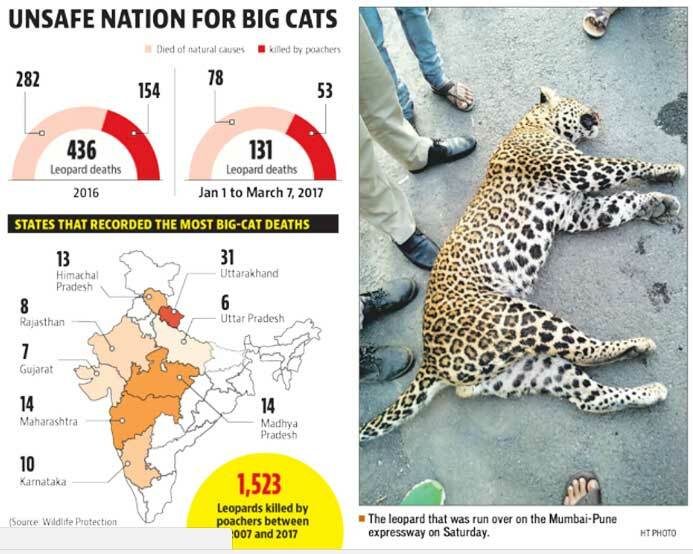 The Wildlife Protection Society of India (WPSI) said that 53 leopards were killed by poachers while 78 died of natural causes or in accidents. Uttarakhand had by far the highest number of deaths with 31, followed by Maharashtra and Madhya Pradesh with 14 each. Himachal Pradesh had 13, Karnataka 10, and Rajasthan 8. “After tabulating the data, we found that approximately two leopards have died every day year this. It is alarming that leopards are still killed for the illegal wildlife trade and that poachers are still active,” said Tito Joseph, programme manager, WPSI. Leopards are protected under Schedule 1 of the Wildlife Protection Act, 1972. According to a nationwide census conducted in 2015 — the first ever leopard census in India — there are approximately 12,000 to 14,000 leopards in the country. In 2016, there were 436 leopard deaths recorded – 282 died in accidents or of natural causes and 154 were killed by poachers. WPSI data also shows that poachers have killed 1,523 leopards since 2007. WPSI compiled the data using information from police stations and wildlife sanctuaries within and outside protected forest areas. “Our field officers take stock of all deaths and the information is sent to our head office in New Delhi daily,” he said. The Wildlife Crime Control Bureau (WCCB) said gangs of poachers target leopards for their skin and teeth. “The figures are alarming. The problem of leopard poaching has resurfaced. We have found metal wires or trap snares, mostly outside protected forest areas and sanctuaries,” said M Maranko, regional director, WCCB. On February 1, the Karnataka forest department recovered and dismantled 121 snares from a 17-km stretch along the Nagarahole National Park boundary. “In most cases, villagers and tribals who are supported by organised poaching gangs tie domestic animals near their villages in to lure leopards. Once they figure out the leopard’s trail, they place snares and kill the cat. Its skin and teeth are sold for $10,000-plus on the international market,” said Maranko. He added that there was an urgent need to make forest officers aware of poaching techniques and to increase patrolling. “The reason Uttarakhand saw the most leopard deaths is that the terrain makes vigilance difficult. Poachers use this to their advantage. In Maharashtra and Madhya Pradesh, forest officers need to keep watch over areas that are not protected,” said Maranko. Experts said the issue of leopard conservation needed more attention. “Leopards are easy targets for poachers. As efforts to save tigers have been ramped up, poachers have started targeting leopards instead. People are less tolerant towards leopards as they have heard of cases in which the big cats have attacked and killed livestock,” said Krishna Tiwari, a wildlife researcher and conservationist.